GG Poker is one of eleven online poker sites that are owned and operated by GG Network which was launched in 2014 with a focus on the Chinese and South East Asian market. GG Poker is now one of the most popular destinations for Asian online poker players who are attracted to the site’s innovative poker varieties, excellent graphics, and unique features. GG Poker is widely recognized as the 8th largest poker site in the industry and one of the fastest growing. GG Poker holds gaming licenses issued by the UK Gambling Commission as well as Gaming Curacao. On top of offering players a fun and sociable poker experience, GG Poker also boasts an extensive selection of online casino games and table games such as blackjack and roulette. GG Poker also has an excellent sportsbook which offers great odds on almost every betting market imaginable. They have a long list of daily tournaments, special features such as All-In Poker Insurance, PokerCraft, Tournament Staking, Hand Moments, Tournament Dollars and customized table skins. GG Poker can be accessed in three different ways. Players can quickly download casino software for the desktop version for their PC or they can choose to download GG Poker’s mobile app for all mobile devices by clicking on the “Download Now” icon which is prominently displayed at the top-right corner of the main page. Players can also get right into the action using the “Instant Play” option. Download The Poker Software – It’s easy to download GG Poker’s software to your PC or mobile device. Simply click on the “Download Now” button, double-click on the download file, select which language you prefer, and then click on “Install”. Once the software has installed, all you need to do is launch it by double-clicking on the GG Poker desktop icon. Sign Up For A Free Account – Opening an account at GG Poker is completely free, and it only takes a minute or so to do. Open the GG Poker app and then click on the green “Sign Up” icon in the top-right corner of the screen. This will prompt a popup window where you can choose a username and password, select your country of residence, fill in your email address and choose your preferred currency. There are about 30 different currencies to choose from including the United States dollar, Canadian dollar, euro, Swedish Krona, and several Asian currencies. You will also need to leave a check mark to agree to GG Poker’s Terms and Conditions and confirm that you are at least 18-years-old. After that, click on the “Create Account” icon. Make A Deposit – The only thing that’s left for you to do before hitting the poker tables is to make a deposit. Before you do this, make sure to check out which bonuses and promotions you can claim for making your deposit. These will be detailed further on. To make your deposit, click on the “My Account” icon at the top of the page. This will open up a new window that allows you to make deposits, withdrawals, transfers, see your account history, and change your personal details. Click on the “Deposit” icon on the left side of the screen, select your country of residence, and then choose one of their many payment methods. Payment options differ depending on where you live but GG Poker accepts major credit and debit cards. You can deposit using E-Wallets like ecopayz and Paysafe as well as E-Vouchers like ePro. All of these deposit methods are instant and will be credited to your GG Poker account balance right away. Players can also make deposits using cryptocurrencies and those deposits are processed and credited to your account within 2 hours. A free tournament ticket is also automatically awarded to those who deposit using cryptocurrency. The minimum deposit amount is $10 while the maximum is $5,000 although these maximum and minimums depend on which payment processor you use. Once you have selected your preferred method of payment you just need to fill in the amount of your deposit and click on the “Deposit Now” icon. If you use any of the instant deposit methods then your account will instantly reflect the updated balance and you are all set to head to the virtual tables for an exciting poker experience. Choose Your Game – Players can choose whether they would like to enjoy a cash game or participate in a tournament? Cash games are available around the clock and there are always a lot of players online. You can get into a hold’em ring game for as little as $0.05/$0.10 and as high as $25/$50. All tables seat a maximum of six players and the rake is just 5 percent on pots that exceed 2.5 times the big blind. Omaha and Omaha Hi-Lo fanatics will also be able to get their fill of exciting action for as little as $0.05/$0.10 all the way up to $25/$50. The 3 percent rake on pots exceeding 2.5 times the big blind is rather attractive too. If you aren’t sure how to play Omaha or Texas hold’em poker then you can check out the informative tutorials that can be accessed at the bottom of the main page in the “Online Poker Info” section. GG Poker is an excellent site for both amateur and experienced poker players. With so many tournaments and exciting cash games, it’s easy to see how GG Poker has gained so much popularity in such a short amount of time. 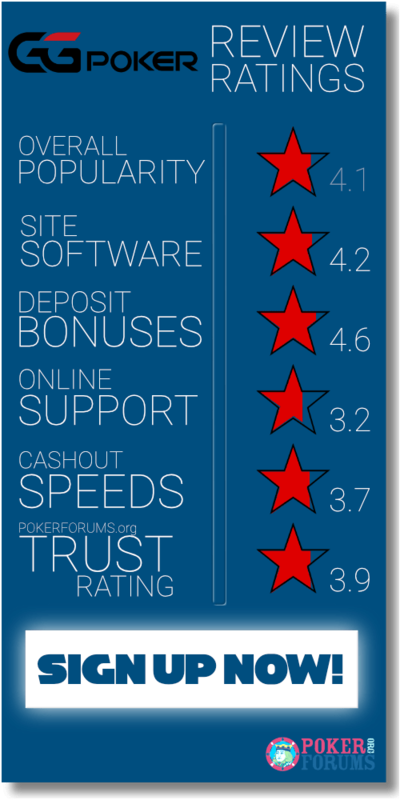 The number of awesome bonuses and promotions just add to reasons why players are loyal to GG poker. The online poker site has a quick account registration process, offers quick and painless deposits and withdrawals, and their 24/7 customer service team is very helpful and efficient. GG Poker offers their players plenty of valuable bonuses and exciting promotions. Just be sure to read the terms and conditions that apply to each one before you avail the bonus or promotion. Fish Buffet Rewards – Fish Buffet Rewards is a special loyalty scheme through which players can unlock bigger and better rewards as they climb the ladder. Like almost every other loyalty program, the more you play, the bigger the rewards. Customers are automatically enrolled when they open a GG Poker account. One Fish Buffet Point is credited for every penny that you generate in rakes. The Fish Buffet food chain consists of 25 levels ranging from Plankton to shark and each level you reach unlocks new rewards and gives you a shot at some nice cash prizes by spinning the prize wheel. First Deposit Bonus – Your bankroll will get an immediate boost when you make your first real-money deposit at GG Poker. They will triple your first three deposits of up to $500 and no special code is necessary. This means that if you make your first deposit of $100, GG Poker will throw in another $200 in bonus cash. Deposit $500 and you will get an additional $1,000 in bonus money. The bonus cash is paid out in $10 increments as you play. Big Hand Jackpot – One of the more popular promotions at GG Poker is their Big Hand Jackpot promotion. All you need to do in order to get a piece of the jackpot is to hit quads, a straight flush, or a royal flush while playing in any Omaha or Texas hold’em cash game. You win your share even if you end up losing your hand. The size of the prize depends on the difficulty involved in getting your monster hand and it also depends on the stakes. Obviously, higher stakes means a bigger cash prize. Making a straight flush in a $5/$10 hold’em game will win a much bigger prize than making one in a $0.05/$0.10 game. The only catches are that you must use two of your hole cards in either Texas hold’em or Omaha and the pot must equal or exceed 10 big blinds. This means that you would need to have a pocket pair in order to win a Big Hand with quads. The jackpot is always growing and it is funded by both Omaha and Texas hold’em cash games. You can check out the current jackpot and recent winners by clicking on the Big Hand Jackpot counter. $100K High Roller Event – If you are looking for some high roller action then the $100K High Roller Event is the game for you. These action-packed tournaments with $100K in guaranteed cash prizes run daily at 5 pm UTC and the buy-in is $5,000. Poker pro and Twitch streamer Bryn Kenney will sometimes stream these events live so you can watch all of the thrilling poker action through the poker master’s eyes by tuning into his Twitch channel. Players start the tournament with 10,000 chips and blind levels last 10 minutes. Late registration closes 130 minutes after the game begins. Weekly Missions – These challenges add to the overall experience of playing at GG Poker. Players are tasked with a list of missions that they must complete. Examples of these missions are being dealt pocket aces in hold’em, running it three times in Omaha or participating in one of GG Poker’s Daily Tournaments. Players who successfully complete 5 missions in a week will be awarded entry into the Mission Complete $5,000 Freeroll. You will be given your choice of three missions every day and only one needs to be completed. Once you complete at least 5 of these missions then you automatically entered into the Mission Complete $5,000 Freeroll. If you complete more than 5 missions then you will start the freeroll with a bigger chip stack. Five completed missions gets you 2,000 chips to starts with, six missions gets you a starting chip stack of 4,000 chips, and you get a starting stack of 10,000 chips if you successfully complete seven missions. The Mission Complete $5,000 Freerolls starts at 2 pm UTC and late registration lasts for an hour. Don’t worry if you miss a day because you’re still eligible as long as you complete 5 missions in the seven-day span. Coin Premium Event – Those who use cryptocurrency to make their deposits are automatically rewarded with free tournament tickets. GG Poker will give you up to 10 percent of your deposit in free tickets. There are no special codes or other requirements. Simply deposit using cryptocurrency and the tickets will immediately be credited to you. Of course, the more you deposit, the more valuable the tickets. Don’t forget that if you make your first deposit using cryptocurrency then you will receive the 200% deposit bonus too. Tournament Leaderboard – Players who play in any GG Poker tournament are automatically awarded points on the Tournament Leaderboard. All you need to do is play and you are eligible to get a piece of the T$100,000 that is being given away every month. The bigger the tournament buy-in and the more tournaments you play in increases your chances of winning. Players earn one point for every $1 spent on tournament buy-ins and even more points are awarded for finishing tournaments in the money. The number of points awarded is calculated by dividing the total tournament entrants by your finishing position and then multiplying that number by the buy-in amount. So, if you buy-into a tournament for $100 and there are 200 entrants, you would be awarded 4,000 points for finishing in fifth place. A T$ prize is awarded to the top 100 point producers each month. Depositor Freerolls – You would think that a 200% First Deposit Bonus would be enough but GG Poker has another treat in store for those who make deposits during the week. You can get your hands on a pair of tickets into the weekly Depositor Freeroll which starts every Sunday at 8 pm UTC. You will receive your complimentary tickets within 72 hours of making your deposit. The Depositor Freerolls feature a $25 cash prize pool. All-In Or Fold – If you like fast action instead of waiting impatiently to be dealt premium starting hands then you will love GG Poker’s All-In or Fold cash games. The way these games work is you have eight big blinds when you take your seat. When the action gets around to you then you must either fold or go all-in. It’s as simple as that. Tournaments – One area where GG Poker really excels is in the area of tournaments. There are plenty of tournaments for players of any skill set and budget. GG Poker offers $100,000 in guaranteed prizes on a daily basis with Sundays featuring double the prize pool. If you win your way to a final table in any tournament there are even more features available to you. You can choose where you sit, time limits are set, and deal-making is allowed. Daily Guarantees – There is no less than $100,000 up for grabs in the Daily Guarantees which kick off at the top of every hour. Buy-ins range between $4 and $150 and all sorts of formats are offered such as Bounty Hunter tournaments and Omaholic. There are also plenty of freerolls. Phoenix Rebuys – Phoenix Re-Buy tournaments give players the opportunity to re-buy up to three times the original starting stack when the initial re-buy period ends and you can also get an add-on. Experienced re-buy tournament players know that they usually have significantly smaller stacks after they re-buy compared to the other stacks. Phoenix Re-Buys get you back in the thick of things right away. Players start with 2,500 in chips and if they need to buy-in again prior to the end of the tenth level then they can get another 2,500 chips for the original price of the buy-in. Second re-buys are offered between levels 11 and 14.and they cost twice the original buy-in but players get 7,500 chips. Finally, players can get a 15,000-chip add-on for double the original buy-in during level 15. $25K Sunday High Roller – If you are looking for one of the biggest games around then you will want to check out the $25K Sunday High Roller Tournament. A $500 buy-in gets you a shot at winning a big piece of the $25,000 in guaranteed cash that’s up for grabs. If $500 is a little too rich for your budget then you can always claim a seat by winning any of the satellites that run from Monday to Saturday. Satellites with $10 buy-ins start at noon, 1 pm, and 2 pm Monday to Saturday and $50 satellites get underway at 3 pm between Monday and Saturday. The $25K Sunday High Rollers start at 3 pm every Sunday. Mini-Mega Series – Every day, GG Poker offers tournaments that have micro buy-ins and offer great prizes. With buy-ins starting at just $1, six Mini-Mega tournaments are held each and every day. The $2 Mini-Mega starts at 10:15 am daily and it is followed by the $4 Mini-Mega Deep Stack at 2:15 pm. At 5:15 pm, players can compete in the $1 Mini-Mega Turbo which is followed by the $3 Mini-Mega 6-Max at 8:15 pm. The $1.50 Mini-Mega Rebuy gets underway every day at 11:15 pm and the Mini-Megas wrap up with the $2.90 Mini-Mega Bounty at 3:15 am. All times are UTC. Omaholic – There are over 2 dozen Omaholic tournaments held every day at GG Poker and the buy-in range between $1 and $100. The guaranteed prize pools are doubled on Sundays and there are regular satellites running throughout the day. Omaholic tournaments combine the excitement of Omaha with the thrill of collecting bounties. T$ Builders – These tournaments give players great value as there is no fee added to the buy-in and 100% of the entry fees go directly toward the prize pool. Winners are paid in T$ which is tournament money. T$ is a special currency that allows players to enter any tournament. T$ can be used to pay a part of the entry fee or the entire entry fee. These tournaments begin every half hour and players can buy-in for $1, $2, $4 or $8. Each T$ Builder allows players to enter up to 15 minutes after the scheduled start and there are over three dozen of them held every day. Chinese Zodiac Freerolls – The freerolls run every 2 hours and they give players a chance to win special Chinese Zodiac avatars. There is also a $31.50 ticket into the Turbo satellite to Bounty Hunters tournament that is awarded to the winners. Second and third-place finishers will be awarded a $10.50 Turbo Satellite to Bounty Hunters tournament ticket. All-In Poker Insurance – Did you know that you can get paid if you lose at GG Poker? It’s possible when you choose to buy All-In Poker Insurance. Now, when you go all-in against one other player as a favorite, you can choose to buy insurance. If you buy the insurance and lose the hand then you still collect. There are quite a few simple rules that say when you can and can’t take out insurance as well as some other parameters that can be found by navigating to the “Special Features” header at the top of the main page and then selecting All-In Poker Insurance. PokerCraft – While GG Poker strictly forbids the use of any third-party poker software from being used, they do allow their own PokerCraft Poker Tracker to be used by players. This software analyzes and keeps track of every hand you play. Whether it’s Omaha or hold’em in cash games or tournaments, you can filter your results and keep track of your wins and losses, your opponents, your big hands and much more. The Hole Card Matrix lets you see all combinations of starting hands and how you did with each one. Tournament Staking – Have you noticed a certain player that seems to do really well in tournaments? Do you wish you were that player? Well, now you can stake a portion of a player’s entry fee into a tournament. You can also sell your own action and have other players invest in you. Check out the “Staking” tab in the main tournament lobby for more information. GG Poker separates their site from all of the others in many ways and their Final Table Features is just another example of how they make the site so fun for everyone. In order for the Final Table Features to kick in, all players must be in the money at the final table. Tournaments that have 6-player tables must have had a minimum of 30 entrants while tournaments that have 9-player table must have had at least 50 entrants. Do note that Final Table Features aren’t available in freerolls, satellites or T$ Builders. Switch Seats – One of the features is GG Poker’s Switch Seats option which gives you the option of changing seats when you get to the final table of an online tournament. You can select any seat and you will automatically switch places with that player. The player with the smallest stack has 30 seconds to act first and then it works its way to the largest stack. Game Clock – Every player has a limited amount of time to act at the final table. Your clock begins its countdown when the action gets to you and if you end up using all of your time then you will have 5 seconds to act. The amount of time that each player starts with is calculated using a formula. The maximum clock time is 15 minutes while the minimum is one minute. Deal Making – This feature gives players a chance to alter how the prize money is distributed. A player can select the “Deal” button which brings up the Deal Arrangement page. Make your proposal and if all of the other players agree to the terms then a deal is struck and the prizes are awarded. There are always terms and conditions regardless of which gaming site you play at. As could be expected, these terms and conditions vary from site to site. Let’s take a look at some of the most important ones that apply to GG Poker. To start with, people who are under the age of 18 are prohibited from playing at GG Poker. Players must be of legal age in the jurisdiction in which they reside to be eligible to play. Before you can make a withdrawal or become eligible for some of the bonuses and promotions, GG Poker will need to verify your age as is required by law to help prevent underage gambling and things such as fraud and money laundering. You will be asked to submit a copy of valid picture ID such as a driver’s license, passport or a National ID card. Your name needs to be clearly visible, written in English, and your signature must appear on it. You will also be required to submit proof of address using a utility bill, bank statement, or a credit cards statement. These documents must be no more than three months old and they must show your full name and address. If you send a copy of your credit card statement then you want to make sure that you black out the eight middle digits of your card number. When you have copies of all the required documentation, you can send scanned copies to the help desk. You can be confident that GG Poker will keep all of your personal information private and none of it will ever be shared with a third party. -Afghanistan, Åland Islands, Algeria, American Samoa, Angola, Bahrain, Belize, Bonaire, Saint Eustatius and Saba, Cuba, Curaçao, Eritrea, Ethiopia, Korea, Kuwait, Liberia, Marshall Islands, Mauritania, Netherlands Antilles, Norfolk Island, Oman, Palestinian Territory, Occupied, Rwanda, Saint Martin (French part), Seychelles, Somalia, South Georgia and the South Sandwich Islands, Sudan, Tunisia, Virgin Islands, British, Virgin Islands, U.S., Yemen and Zimbabwe. -Albania, Australia, Belgium, Bulgaria, Canada, Czech Republic, Denmark, Estonia, France, Greece, Ireland, Israel, Italy, South Korea, Philippines, Poland, Portugal, Romania, Spain, United Kingdom and United States of America. Keep in mind that GG Poker can amend this list at their discretion. You might also be wondering about the rollover requirements that need to be met in order to cash out bonus money. You need to generate wagers equaling the amount of your bonus. If you get a First Deposit Bonus of $50 then you would need to make $50 in bets in order to release the bonus money. However, with so many different bonuses and promotions being offered at GG Poker, it is important that you read and understand the terms and conditions that apply to each one because they vary. GG Poker has a strong policy when it comes to responsible gambling. The online poker site provides players with a set of tools that will help prevent them from going overboard and exceeding their gambling budgets. When you click on the “My Account” button, which is located at the top of the main page, it takes you to the same page that you used to make your deposit. You can click on the red “Responsible Gaming” icon and you will be redirected to another page that gives you access to these tools. You can set 1 day, 7 day or 30 restrictions on your account so that you stay in control. You can set daily, weekly or monthly deposit limits or you can request a self-imposed Timeout which will give you a bit of time to cool off. Timeouts can be set for 12 hours, 24 hours, 1 week, one month, 2 months or 4 months. If you feel that a Timeout is not enough then you can opt for self-exclusion which stays in effect for 6 months. You can also request permanent exclusion by emailing support@ggpoker. It is highly recommended that if you opt for self-exclusion then you should do the same at any other gambling website you belong to. Also, once you choose to self-exclude, your decision cannot be reversed. If you have any questions about any of these options then don’t hesitate to contact the help desk. There are also many other resources available to you if you feel that you or someone you know may have a gambling problem. If you are not sure if you have a problem with gambling then you can take the “Self-Assessment Test” that is located at the bottom of the GG Poker’s Responsible Gambling page and also at the bottom of the main page under “Poker Safety and Security”. Parents who have minors living with them might be concerned that they could access online gambling sites and GG Poker can help prevent this from happening. They provide some basic tips such as do not leave children unattended while GG Poker is running and keep your login information protected. GG Poker strongly recommends that you teach your children about the legality and hazards of gambling. On top of these suggestions, GG Poker has links to effective filtering software that will block underage people from accessing select websites and software. Cyber Patrol, Gamblock and Net Nanny can be very helpful to those who have concerns. The best part of playing at online gambling sites is that magic moment when you make a withdrawal. While some sites are notorious for creating hassles when it comes to cashing out your money, GG Poker makes it easy. You need to remember that before a withdrawal can be processed you will need to verify your age, identity, and address as explained previously. This isn’t some unnecessary random hoop that GG Poker makes their customers jump through. This is required by law. So, let’s assume that you are verified and you want to make a withdrawal. Click on the “My Account” icon which is at the top of the main page. The same window that popped up when you made your deposit will appear again. This time, click on the “Withdraw” button and you will then be taken to another page where you can enter the amount you wish to cash out, select the payment method and account information. All you need to do after that is press the green “Withdraw” icon at the bottom of the page and you’re done. You will most likely have to make your withdrawal using the method that you used to make your deposit. If that is not an option then you will need to select another withdrawal method. Also, keep in mind that there may be a small fee attached depending on which payment method you use and some payment processors take longer than others to complete withdrawals. GG Poker aims to make sure that all of their customers enjoy themselves and that fair play is the only kind of play that happens. This is why they have implemented a few unique rules that are specifically designed to deliver an enjoyable and fair poker experience to all of their customers while providing them with protection. Predatory Behavior and Bumhunting – Any activity that is focused on exploiting others for monetary gain is considered as predatory behavior and will not be tolerated. An example of such behavior would be singling out a weak player and only playing against him or her while avoiding other players. Players are urged to report predatory behavior and those deemed to have broken this rule could face banishment and have their funds confiscated. Chatting Policy – It’s one thing to poke a bit of fun at somebody but GG Poker will not tolerate foul, abusive or racist language nor will the put up with spamming, asking other players for money, or discussing active hands. Those found in contravention of these rules can face penalties ranging from suspension of chat privileges to a lifetime ban. This policy also extends to nicknames and avatars. External Assistance Software – There are plenty of third-party poker programs that are designed to give you an edge. In the spirit of fair play, these programs are not allowed to be used at GG Poker under any circumstances. GG Poker will take action such as blocking access to the site, banning for life, and confiscating funds if they have reason to believe that such software is being used. Collusion – Collusion occurs when two or more players secretly exchange important information in order to gain an advantage over other players. In other words, collusion is cheating. GGNetwork employs state-of-the-art software which analyzes hands and players’ histories to see if any suspicious activities have taken place. Hand histories, patterns of wagering, and players involved in hands are frequently looked at to ensure no collusion is going on. Players suspected of collusion face a lifetime ban and they may have to forfeit their funds. Ratholing – Ratholing is the practice of taking a short stack to a table and then leaving if their stack reaches a certain point only to intentionally go to another table with another short stack. While ratholing is one of the less egregious offenses on the list, GG Poker will still penalize those who engage in it. These policies are a very effective way of ensuring that poker players of all skill levels can enjoy themselves and not be offended or taken advantage of. GG Poker calls it a healthy poker ecosystem and it is the key to providing the most enjoyable poker experience possible. If you feel that other players are breaking these rules then you are urged to contact the support team. BMM Testlabs is a highly-respected independent third-party software testing company. BMM has been an industry leader for more than 30 years and they have a solid track record and reputation for exceeding the expectations of their clients. BMM Testlabs has thoroughly tested GG Poker’s gaming software to ensure that it meets or exceeds the jurisdictional and technical standards. This means that those who play any of the games that are offered at GG Poker can be certain that the games are fair and that they function the way they are supposed to.